Directional crystallization of binary melts is one of the ways of obtaining solid materials, the quality of which is completely determined by the physical and regime parameters of the solidification process. It is well known that, under certain conditions, the solidliquid interface becomes morphologically unstable and the constitutional supercooling occurs ahead of the planar solidification front, which leads to the appearance of a metastable region. In this supercooled region, crystals can grow in the form of dendrites, grow on impurity inclusions, etc. As this zone is transitional between the already formed crystal and the melt, it is called a two-phase zone. In this paper, we present the results of numerical experiments carried out in accordance with the model taking into account the formation of a two-phase zone. In particular, qualitative and quantitative patterns of the time dependence of the formation of a two-phase zone in the Fe-Ni melt are obtained under two different regimes of active and passive cooling. Based on the results of calculations, it can also be concluded that, in both cases, there are such values of the cooling parameters, under which a two-phase zone is formed very close to the right boundary of the sample, i.e. practically the whole sample remains homogeneous. Choosing the appropriate cooling mode and its parameters makes it possible to optimize the directional crystallization process both in the quality of the obtained alloys and in the speed of their production. Polyurethanes generally have low thermal stability and thermal degradation can occur during exploitation above 180 °C. It is assessed that the modification of the polyurethane chains via forming thermally stable permanent heterocyclic structures can improve the thermal stability. Polyurethane foams based on networks with isocyanurate rings are generally insulation-grade and have excellent thermal stability. In order to assess a quantitative contribution of pendant chains, polyurethane soft elastomers based with a controlled architecture were synthesized by prepolymer procedure. A simple strategy was developed to prepare networks based on poly(oxypropylene)diol and 2,4-TDI by adding the monofunctional component for prepolymer synthesis. Network formation was described using the cascade theory. Mechanical properties were determined from stress-strain experiments. It was estimated that the increase of the monool in the precursor formulation influenced the increase of energy at break and the elongation but affected to decrease of Young modulus. A methodology was developed for the casting of samples of AlSi7Mg alloy modified with nanocomposites (NCs). The following NCs were used: SiC + Cu, AlN + Cu + Al, TiN + Cu, SiC + Al, SiC + Ag Cu, where Ag and Al are cladding metals. The introduction of the nanocompositions takes place in the crucible of a furnace. A thin-walled cylindrical casting mould is used on whose axis is installed a protected thermocouple to measure temperature variation as a function of time. The effect of NCs on overcooling and on sample structure is established. The structure and physicomechanical characteristics of vacuum coatings formed from refractory metal compounds on steel substrates of different chemical composition are studied. The possibility of applying refractory metal coatings to protect metal substrates used for the manufacture of metalworking tools and steel tools used for casting non-ferrous metals has been analyzed. In this study, the stress state of metal coating on a steel substrate under tensile straining was investigated by with finite element modelling with the aim of better understanding the mechanism of delamination for the coating. The investigations showed cracking and delamination of the coating by the application of uniaxial tensile strain to the substrate. Due to interfacial stress crack appeared in the coating-substrate interface. The stress measurements in coated substrate, using FEA, indicated interfacial shear and peeling stresses at the interface near the edges of the coating under tensile load. When tensile stress is applied externally on the coated substrate, the coating exhibits multiple cracking perpendiculars to the tensile direction, and then interfacial debonding occurs. A good agreement is found between the modelling approach and the corresponding experimental tensile tests of the coated specimens. The effect of coating thickness on the evolution of the stress distribution was also studied. The cracking and delamination of the coatings with a thickness ranging from 90 to 160 m was studied by tensile test experiments. The estimation of the stress distribution and concentration at the interface during these experiments allows the failure stress of the coating in the interface coating–substrate to be evaluated. Three-dimensional (3D) printing technologies have been developed for prototype purposes. However, it has become possible to manufacture various functional parts with improving mechanical properties of 3D printing materials. Although polylactic acid (PLA) is the most widely used 3D printing material, the mechanical properties required for functional parts are not sufficient. For this reason, carbon fibre reinforced PLA composites are preferred as 3D printing material to advance the mechanical properties of the fabricated parts. However, for 3D printed parts, it is known that the layer thickness and printing orientation angles affect the mechanical properties. In this study, unreinforced PLA and 15% carbon fibre reinforced PLA composite tensile specimens were 3D printed using fused deposition modeling (FDM) technique. The effects of printing orientation angle and layer thickness on modulus of elasticity and tensile strength are investigated. 3D printed unreinforced PLA samples exhibited better tensile performance as compared to carbon fibre reinforced PLA composite samples. Not all the properties of structured surfaces can be predicted just through using stationary solutions. Hydrophilic and hydrophobic qualities distinctly manifest themselves when surface contacts with mobile liquid; besides, shape of surface projections could variously influence flow velocity in different directions forming turbulences behind projections (even cavitation zones if flow is very fast). The following properties of liquids are particularly important for these processes: dynamic and kinematic viscosity, density, flow velocity and characteristic flow size, which represents itself contact surface relation to cross-sectional area. Relationships between these parameters characterize flowability of the particular substance and can be expressed as Reynolds number. Solutions of kinetic equations could be helpful to develop understanding on particular fluid’s flowability in the close vicinity of the surface. 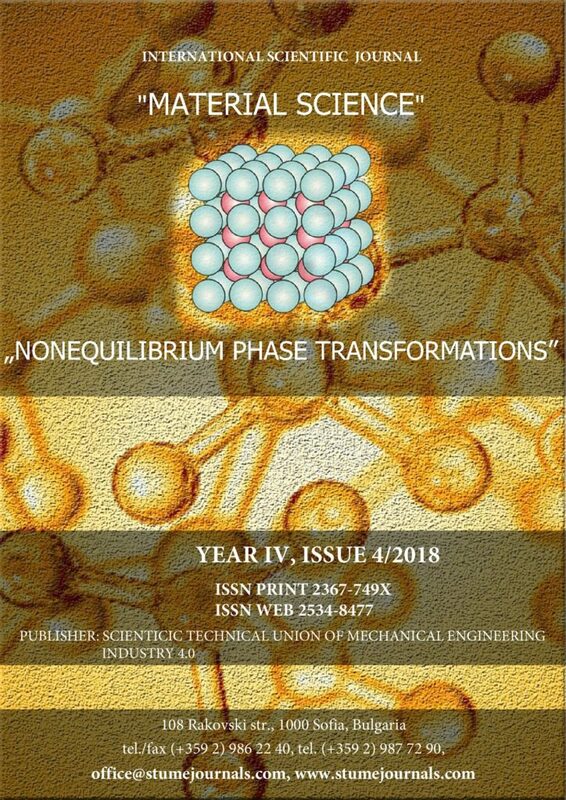 Examples discussed in this paper can be used not only in nano- and microstructures related research but also for high school and university students training in physics and natural sciences. Comprehension development about flow rate diferences in various distances from tube walls should be considered as one of problems for successful acquiring of hydrodynamics topics. Even use of transparent tubes is not helpful enough for appropriate demonstration of tinted liquid speed distribution in flow’s cross-sectional area – laminar flow when Reynolds number value is low and turbulent flow when it is high. In this research work, results of the ion plasma nitriding of the ferritic steel AISI 430F are presented . From the raw material solid bar ф35 were machined specimens with the following dimension 20x20x15. Prepared specimens were plasma nitrided in the installation ION-20. According to research plan the temperatures of 430, 480 and 530 0C, and nitriding times of 3, 6 and 9 hours were used. Nitriding gas for this experiment was ammonia Pulsed direct current was used for the nitriding. After performing of the ion plasma nitriding process, experimental specimens were subjected to different investigations, mainly microstructural and tribological. Main facilities used for investigations are: device for determination wear resistance “ball-on-disc” (Nanovea), 3D profilometer for surface roughness determination, Optical Microscope Leits and SEM JEOL for microstructural investigations, XRD spectrometer (Rigaku RINT Ultima+) and Vickers microhardness tester for the microhardness measurement. Investigations confirmed that depending of the process parameters different characteristics of nitride layers were obtained. The following characteristic values important for the analysis of the nitride layer was obtained: specific wear rate, volume lost, friction coefficient, width of the wear path, type of wear, type of structure of the nitride layer and maximal hardness of the nitride layer. Performed investigations confirmed that ion plasma nirtriding improve surface properties of the investigate specimens compered with untreated specimen of the raw material. The effect of ion plasma nitriding is directly influenced by the nitriding parameters i.e. temperature and time of the nitriding process. Model results of solidification processes as a bridge between individual sciences are presented. There is a historical analysis of the development of knowledge and methodologies in different sciences. A methodological scientific approach has been used. It is proposed to develop known scientific methodologies with the expansion of new results. Representations are modeling results in low volume solidification. These tasks are convenient in a mathematical description of an additive approach.